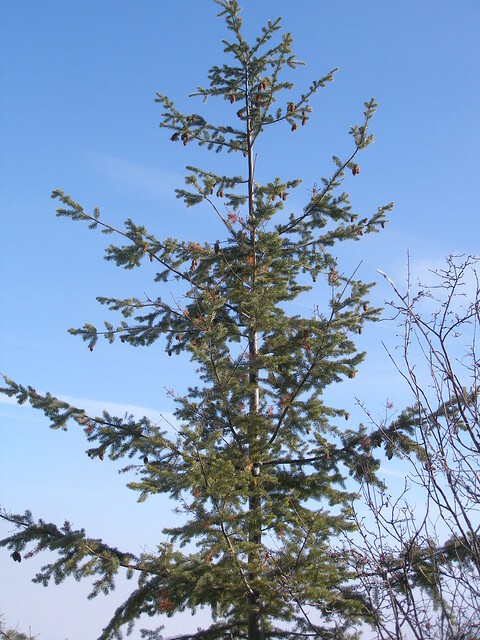 Douglas-fir is one of the world’s strongest, straightest, fastest-growing trees. It is the most abundant tree in the Northwest, and a major commercial lumber species in North America. The wood is relatively heavy, hard, strong, and resilient under stress. Because these trees are not actually firs, the common name should be hyphenated or run together as a single word. Douglas-fir bark is smooth and has resin-filled blisters like true firs when trees are young, but once the trunk is about twelve inches in diameter, the bark grows furrowed and corky. If you were to cut the bark with a knife, it would have wavy bands of light tan and dark brown, like the pattern in a pile of sliced bacon. The needles are about an inch long and are attached to all sides of the twigs. They are not sharp or prickly to the touch. They are green on the upper surface and have two white bands (of microscopic pores) on the underside. Unlike true firs, the cones hang from the branches. The cones have distinctive, three-pronged, pitchfork-shaped bracts projecting from the scales of the cone that look like the tail of a mouse hiding in the cone. Douglas-fir seeds can sprout in partial shade. In closed stands the tree’s lower branches die and eventually fall off, so live foliage often occupies only the upper third of the main trunk. Older trees have very thick bark which allows them to survive moderate surface fires, but even low-intensity fires will kill most Douglas-fir saplings. Native Americans used Douglas-fir in many ways. The foliage was used as a body freshener in conjunction with sweat baths. The needles were boiled as a substitute for coffee. The branch tips were used for tea. A decoction of bark was taken for coughs and colds. A gum from the pitch was used for sore eyes. The active growing shoots of the needles are said to be a good source of vitamin C. Boughs were used as thatching and flooring, and to line cooking pits, serving to flavor the food as well as protect it from burning. And sapling wood was used for dip-net hoops and shafts, berry drying racks, and snowshoe hoops.